Tarps or tarpaulins have been around for a while. You can agree with me that they are an amazing way of creating a dry hang out space when you are out with a group or alone during a wet trip. While they may not be as comfortable as your house could, if you love outdoor activities you will most certainly love your experience with tarps. If you go to the market, you will notice that tarps come in different sizes, weight, material, cost, shape and colors. This review looks at all there is about tarpaulins and the best tarp for you. Uses: Camping covers, camping tarps, hurricane tarps, construction covers, temporary covers. These are plastic based materials. Poly tarps can come in orange, white, brown, blue, silver, camouflage and many others. It is an all purpose cover for construction, camping or backyard. You can find a poly tarp literally anywhere in the market. The price range is quite wide depending on the size. Uses: Equipment covers, supply covers, construction covers and salvage covers. These types of tarps have been in use for many years. They are normally woven fabric that is made of natural or synthetic fibers. Canvas tarps are a favorite of painters because they may not be 100% waterproof and thus they absorb paint although they do not leak through. They therefore maintain a dry soft surface on the bottom of the material. These kinds of tarps are usually made of polyester core that is laminated with vinyl or PVC. Some are open weaved to allow for sunlight and air to flow through. If put under normal conditions, these kinds of tarps can last up to 10 times more as compared to other tarps because they have much better tear resistance and are likely to perform better in harsh conditions. Coated vinyl covers may fade their colors with time. They are made of heavy duty poly coating that is very strong. They are made for the purposes of covering trucks that travel over long distances. The ends of truck tarpaulins have double reinforced fabric. Their interior seams are heat sealed. These types of tarpaulins come with D rings and thus ensuring a safe and secure fit surrounding the perimeter of the truck tarp covering. For additional secure fitting, in each corner of the tarp you will find solid brass grommets surrounding the perimeter. Just as the name suggests, hay tarps are used by farmers to cover bales of hay. They are made of D rings and grommets and thus the reason as to why they are used for heavy duty tasks. One of the great reasons as to why they are loved by farmers is owed to the fact that their material can be UV treated and so they cannot be damaged even with direct sunlight. Hay tarps are also very strong and are waterproof to withstand huge amounts of rain as well as winds. These harps should always be kept dry and must be U.V treated. So as to fasten the tarp to the lumber grommets should be built in with a very close frequency. Because every lumber mill or construction site differs with one another, the uses of lumber tarps are also varied. The most preferred and suggested lumber tarps are heavy duty silver U.V. treated lumber tarps that have a black center. These are made of nylon tarp threading which weaves a component that looks like a screen. Mesh tarps are often used for water or wind to penetrate through. Mesh tarps prohibit hard rain from going through an applied area. When making a shade screen tent, covers and sides made of mesh tarps weaken winds which may come to sweep the canopy tent. On one side of the mesh tarp enters the heavy winds and it slowly blows through to the other side and finally the wind gets defused by the mesh tarp material. If you are looking to secure your tent or canopy, you should consider this tarp because it can be used as side walls that protect the tent or canopy from heavy blowing winds and thus keep the structure strong and stable. Construction companies prefer using black mesh tarps for the purposes of privacy where as green meshes are utilized in tennis and golf courts to complement to the garden setting. These can be found in the sizes of 100 x 100 up to 170 x 170. Baseball taps are expected to be cool and dry therefore because of these they must be waterproof. The tarp may be folded and rolled up to be stored and used for a later day because they are durable. In the event it gets rained on, the baseball tarp should be removed to allow room for the grass to breathe. If you have been of the sense that tarps are all made equal, now you know better. We have established that tarps come in different kinds each with its own special benefits and uses. If you are considering buying a tarp, it is important that you check out the following points before you dish out any money from your pocket. Is the Tarp Waterproof or Not? Check out the label on the tarp to know whether the tarp is simply water resistant or fully water proof. If this is not on the label, you can ask the sales consultant of the store you are buying from whether what you have picked is the right one for your needs. Checking online on reviews could also give you a clear head start. What thickness should the tarp have? If you are in the heavy construction or loading sector then thickness should be something to get concerned over. Otherwise when it comes to other activities such as camping, you should not worry much about the thickness of your tarp. If you are out camping a relatively thin tarp can protect you from the rains. 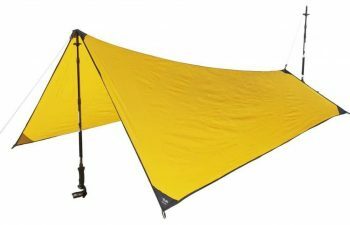 Is the tarp durable for my specifications? At the store get to inquire whether the tarp you would like to purchase is strong and durable. If you are going to use it to tie down important content, be certain that the holes at the end of the tarp seem to be sturdy and secure. Getting to hear about the experiences of others is also one way to know whether you are eyeing the best backpacking tarp. Most buyers tend to confuse the terms cut size and finished size. Well, these are not the same. Cut size simply means the size of a fabric when the fabric has been cut and before the final tarp is produced. Once the hems of the fabric are stitched and sewn the size of the finished tarp becomes slightly smaller as compared to the actual cut size. On the other hand, finished size is the size of the actual finished tarp. These two common terms are standards of measurements used in the tarp industry in USA as well as Canada. Most tarps come in square and rectangle shapes. The reason behind this is because they provide most flexibility and coverage. 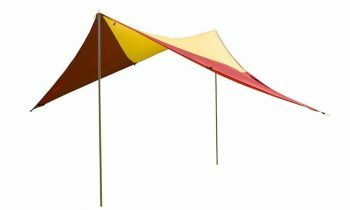 Small rectangles that measure 5 x 8.5 ft when hung diagonally provide basic coverage for hammocks. An 8 x 8 square tarp when pitched diagonally over a hammock its more than 10 foot ridge line offers about 1 foot to one and a half feet of coverage beyond the ends of the hammock. This kind of tarp can be hung at 4.5 to 5 feet above the surface of the earth and its sides can be staked to the ground. Hex shaped tarpaulins have in the recent times emerged. It is less weighty and offers less protection than the rectangle ones and more weighty and offers more protection than the squared ones. These kinds of tarps usually measure about 10 x 12 meters and have several features such as catenary cut edges. They are best when the weather is unpredictable and when situations need extended stays. Despite their large sizes, they still remain to be viable shelters for light weight backpacking community. This is one of the best tarps because it is light weight and versatile thus can be used for a wide range of activities. It is secure and ensures your camp and gear is well protected from damage. It has no sag design for a taut pitch and the square symmetrical cut ensures maximum coverage as well as pitch versatility. Setting up the REI Co-op Camp Tarp 12 is quite easy thanks to the several loop lash points along the edges. The main corner grommets have a double layer reinforcement to provide a strong and stable pitch. The tarp also comes with 6 reflective guy lines for visibility at night or when in the dark. Another amazing fact about this tarpaulin is the fact that it has a 75D polyester that does not stretch even when wet. However, it does come with tarp poles so you have to buy the REI adjustable poles separately. This tarpaulin is very light thus carrying it around is very easy. 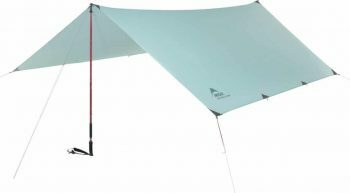 You do not have to worry about the rainy days as MSR Thru Hiker 70 Wing provides ample rain protection. You will find it very easy to adapt to the environment you are in with regards to how you set it up as you can use trekking or accessory poles or simply just suspend it on a tree and enjoy the rest of your outdoor activity. Apart from it being ultra light, both wings can be packed down tiny and comfortably fit in the smallest of all back packs. It is compatible in the sense that either of its wings can actually get paired with thru-hiker mesh house 2 or 3. With MSR Thru Hiker 70 Wing you can be certain to enjoy your outdoor sessions either alone or with a group. This is among the best tarps and it measures 1.76 meters squared by 18.94 square feet. It is very light because it is made of ultra light 30d silicone impregnated cordura fabric. It has a very simple design as you only have to set it up with two trekking poles. However, it does not come with the trekking poles so you will have to buy those separately. It has two guy line points. Rab Element Solo Shelter is open at both ends and thus allowing easy penetration of light and flow of fresh air. Your experience with this tarp will definitely be unforgettable. Escape from your busy schedule and take some time away to some serene and quite environment. But to make that moment memorable, ensure you carry with you the Sea to Summit Escapist Tarp. With it you can enjoy some cool shade and quietness as it protects you from the heat of the sun as well as from strong winds. The material pressure head measures 1200 mm and thus giving you maximum coverage. Just like Rab Element Solo Shelter, it is open at both ends to allow room for the penetration of sunlight as well as flow of fresh air. It is set up using two trekking poles which come separately from the tarp. This tarpaulin shelter creates an outdoor living area to protect you from the elements. Its shape is versatile and it comes with two adjustable trekking poles which are included in the package. Because of its versatile shape, it allows a multitude of pitch configurations. 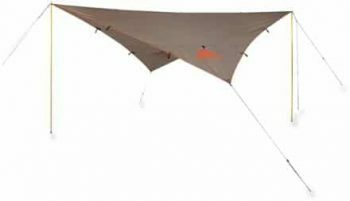 Big Agnes Deep Creek Tarp has an additional pole attachment point at the center of the tarpaulin for the purposes of more set up options. The additional pole attachment point also increases the stability of the tarp in the event of a strong wind. It has reflective guy lines that are equipped with cord adjusters as well as several guy out points. What’s even more exciting is that it has stash pockets at the corners for guy line storage. 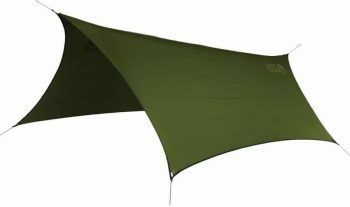 This tarp is made of 40D sil nylon and the package comes together with trekking poles for the purposes of providing an ultra light shelter on the go anytime. It has guy line storage pockets which ensure that your lines are properly organized. The tarp also has adjustable stake loops for solid pitch and thus providing stability of the tarp in strong winds. 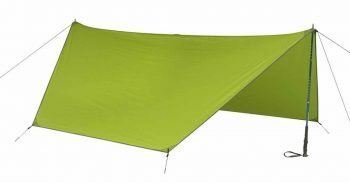 Kelty Upslope Tarp covers a floor area of 37 ft2 area. It’s definitely a contender for the best camping tarp, this one has 15D silicone impregnated rip stop nylon to provide excellent waterproof ability and also to make it be of lighter weight as compared to other tarps. Its set up is super fast and easy as it shoots up in a heartbeat using only four guy points. However, it provides a sprawling overhead shelter. The tarpaulin actually measures only 16 ounces and comes with an already built in stuff stack. This makes it the best choice to take on a trip or store when not being used. ProFly Sil Nylon Rain Tarp is versatile and durable and thus you can use it to shelter your dog, equipment, clothes or your back country kitchen. It is also important to have in mind that it does not come with stakes so you have to buy them separately. Tarps are diverse and come in various sizes, colors, makes and for different purposes. As we have already seen, the type of material used will highly determine the weight of a particular tarp. Shopping for a tarp is not a matter of just picking any tarp that meets your eye. As mentioned earlier, be certain of its durability, ability to prevent water from penetrating, its resistance from chemical solutions and flexibility. If this review has been a great eye opener for you, feel free to drop your comments and share.